Amcorp Mall is a rather unconventional shopping mall compared to many others in Kuala Lumpur, Malaysia. It can't beat the popular ones in size or class (take Mid-Valley Megamall or Suria KLCC for example), but it certainly has its own charms and it attracts a different sort of crowd. There are very few of the big, branded retail shops around. Most of the shops can be considered specialist shops, offering goods and services not normally found in other shopping malls. For example there is a shop selling stamps. I've never come across another specialist stamp shop anywhere in Malaysia! I guess nobody thought a shop like this could survive, but this one seems to have been around for quite a while. There are also quite a few shops selling antiques, and one which sells various types of collectibles. This particular shop is absolutely crammed with things it makes you wonder how to navigate around the place. I had to make sure I keep my arms close to my sides for fear of knocking into anything that could easily break! But surely the most peculiar thing about this mall is that quite a large number of the shops are closed on Sundays! You will never find such a thing in all the major shopping malls. 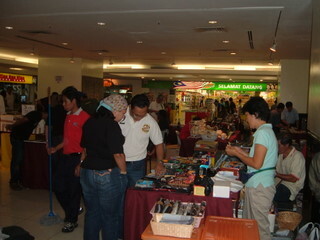 The biggest charm of Amcorp Mall is definitely its weekend indoor flea market. The flea market is open on Saturdays and Sundays, but it's busiest on Sundays as the number of traders are significantly higher. Saturdays are a little quiet but it's a bit more relaxing since the crowd isn't as big. What's so special about this flea market? 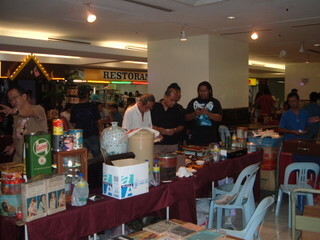 Well, it's supposedly the first flea market held in a shopping mall in Malaysia. It started in 1998 and hasn't looked back since. But what makes it truly special is the various old items on sale here. You can find anything from silverware, porcelain, stamps, coins, old vinyl records, and of course, pewter. The atmosphere is great. Traders and shoppers mingle freely. Some of the traders are always there, some you see only once. Sometimes when I couldn't find any interesting pewter items from the flea market, I would hop into any of the three shops selling new pewterware. But I seldom do this since I prefer used items and the new ones are more expensive. By the way, all three shops are closed on Sundays, although one of them can be found open occasionally. Anyone can set up a stall in the flea market. Setting one up is pretty easy. You just need to book one at the management office on Tuesday for the week that you'd like to set up stall. Payment is 50 Ringgit (about US$14) for a stall on Sunday and 30 Ringgit (about US$8) on Saturday. The busiest area (lower ground floor) is usually reserved to traders who have been there for a long time. Newcomers are normally given stalls at quieter areas on the upper floors. I guess that's fair, since the older traders were the pioneers that helped to make the flea market what it is today. If you're not from Malaysia, then the best way to get to Amcorp Mall is to take a taxi. Any taxi driver worth his salt would know where it is. Alternatively you can take the Light Rail Transit (LRT) on the Putra Line to the Taman Jaya station. The mall is only a couple of minutes walk from there. Arab-Malaysian Malls Management Sdn. Bhd.